Leaderfield by the bridge. Photograph by Ayush Dinker. It was quite congested inside the Sumo. People were crammed up and didn’t understand English or Hindi. We were the only two backpackers in a jeep full of workers, traders and cultivators who were returning to their respective villages after a hard day of work in the capital city of Shilong. Within an hour of leaving Shilong for the deeper parts of the East Khasi Hills district, we knew we were indeed in the abode of snow. The Sumo would drop us off at Pyrunsula, a relatively urbanised small town, acting as a juncture for going to different inner parts of the district. The hilly road, with its share of parabolic turns and slippery slopes, was covered with dense white clouds and the pitch glistened due to the slight drizzle. We were on our way to Mawlynnong- renowned throughout the world for being the cleanest village in Asia (as rated by the travel magazine Discover India), and the unique living root bridges in the neighbouring villages. Around 90 kms from Shilong (the capital of Meghalaya), this village lies very close to the Bangladesh border at Dawki and statistics claim that the village has a 100% literacy rates. There are no beggars either, and they welcome tourists, both national and international, quite heartily. On reaching Pyrunsula we would reserve another taxi for Mawlynnong. We had booked the Sky-view guesthouse at Mawlynnong, and on arriving, found out that, it was a small cosy bungalow with two rooms with a small wooden restaurant next to it. Just adjacent to the restaurant was an around 30-feet high view tower from which the plains of Bangladesh could be seen. We decided to walk up to the top of the bamboo structure, taking a chance of the few minutes of clear sky. Balancing ourselves on the narrow bamboo stairs we reached the platform at the top, and lo and behold, the green plain of Bangladesh was spread at a short distance from us. There were dark black clouds sailing from the infinite horizon over the stretched out greenery and water bodies. As we were having our dinner, a jovial Khasi fellow came and introduced himself as Leaderfield- a carpenter by profession, and who, if we wanted, would be our guide in Mawlynnong. He spoke a decent dose of English and Hindi. It was decided that early next morning we would begin our trek to the Wahthyllong living-root bridge with Leader as our guide. There were large trees surrounding the rocks, and their dark green colour was layered by the grey clouds, and made the entire scene surreal. We continued our trek and reached the Riwai village which housed the famous living root bridge. From here we had to descend steep-slippery-natural-stone stairs lined by moss and algae due to the monsoons for the next half an hour. This kind of stairs is very common in the East Khasi hills, Leaderfield informed us. The rain gathered momentum and from somewhere far away came to our ears the roar of a wild river. We kept on walking and out of the clouds emerged an unimaginably massive structure- a bridge. 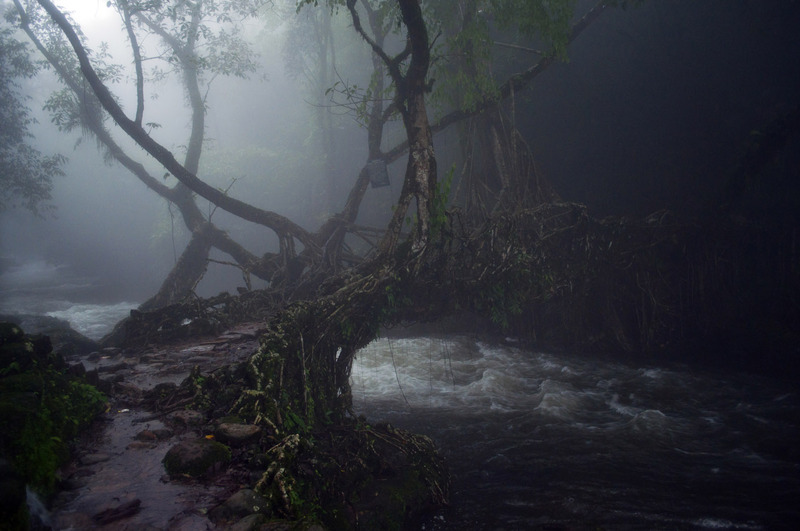 Two banyan trees were planted on the two sides of the mad gushing river, and their roots jutting out ferociously from all sides held together a narrow path made up of stones and boulders. And below the bridge flowed the Wahthyllong River flowing in cascades and jumping eccentrically all the while creating a deafening sound. Typical only to the Khasi Hills region of Meghalaya, the story of the living-root bridge is something like this- hundreds of years ago, natives (“our fore-fathers”, as Leader referred to them) planted two banyan trees on the two banks of the river and around fifty years after that, when the roots came out properly, they tied it together with long bamboos, and thus the living-root bridges were formed. 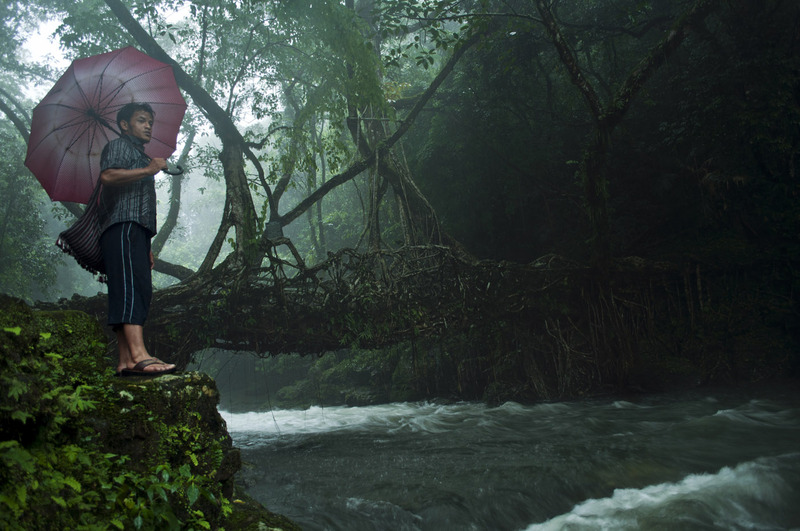 In broken English, Leaderfield described the living-root bridges as “natural bridges shaped by humans”. On reaching the village which housed the waterfall, Leader told us that we would have to trek for another 45 minutes- and this trek, he added, would be through thick forest filled with all sorts of insects, snakes including King Cobras, lots of slippery steps, and the omnipresent invisibility. After around 20 minutes of trekking we reached a hanging bamboo-wood bridge over a stream in the jungle. The scene was quite picturesque – as if straight out from a movie sequence; the stream flowed vehemently and the downpour was strong; diagonally from the centre of the bridge you could see a beautiful waterfall and hills covered by thick forests enclosed the entire setting. As we kept on moving ahead, a very loud gurgling noise came from the interiors and it seemed as if some rocket was being launched. We kept on walking behind Leader and from the smile on his face we could make out that very soon he would reveal his trump card. We walked on for a couple of more minutes, and then, the sigh which met our eyes was simply unbelievable. Imagine this- a massive waterfall say of the height of a twenty storied building is flowing with all force, and you are standing at a balcony on the tenth floor and seeing the water fall in front of you. Yes, that’s what it was. A narrow pavement was carved out through the hill for tourists to walk behind the waterfall. We described to him our awesome experience and thanked him for the suggestion. And gradually, over the cups of tea, began a prolong discussion on Mawlynnong’s history and unique culture, its segregation from heartland India and financial exchange with neighbouring Bangladesh. We bade him goodbye as we wouldn’t meet him early morning before leaving, and accepted his offer to return again in December and go on trekking taking him as a guide, through, as he puts it, “the virgin forests of the beautiful East Khasi Hills”. This travel-story appeared in The Eclectic Northeast, October, 2012, with photographs by both Ayush Dinker and myself.